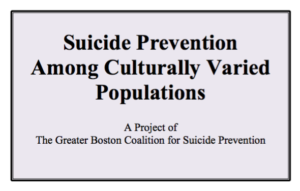 The Greater Boston Suicide Prevention Coalition noticed that their membership didn’t represent the diversity of the Greater Boston Area, and that their prevention efforts were not always designed to meet the specific needs of diverse populations. In order to help them learn more about the needs, interests and health perceptions of particular populations, Connection Lab conducted and analyzed focus groups about suicide prevention with 11 different identity groups over the course of two years. The results were shared at conferences and informed the coalition’s release of minigrants to member organizations to develop culturally-appropriate prevention initiatives.